When cats are sick or they’re in pain, they have this innate ability to hide any clinical signs. They’re masters of disguise. They just kind of pretend as though they’re just a hundred percent and it probably goes back to the fact that they evolved from the African Wildcat. When you think about that, it was survival of the fittest and cats have inherited that trait. So, it becomes very challenging as a cat parent, how do you know when your cat’s sick. 1 How to tell if your cat has a fever? 2 How to give your cat a pill or how to pill a cat? 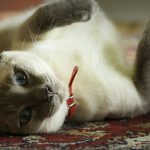 3 How to give your cat a bath? 4 My cat won’t eat. What could be the reason? 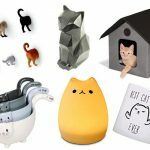 5 Why do cats knock things over? 6 How to litter train a cat? How to tell if your cat has a fever? Well, the key word here is ‘change’. So if your cat normally sleeps on your bed at night and all of a sudden he’s not well, red-flag. If he always uses his litter box and all of a sudden he urinates on the basket of clean clothes or in the bathtub, something’s not right. Usually when you sit down at night, and your cat’s social and rubbing up against you and jumps on your lap and she’s not doing that anymore, then it’s a key sign that she’s not feeling well. 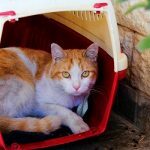 If she is the first one to run down the stairs when its meal time and you find that she is just lagging behind the others very subtly, that’s a sign that your cat’s not well but they’re sick, they’re in pain and that you need to seek veterinary care. Your cat could lose half of her body weight and be very ill over a large period of time and she can pretend to be perfectly fine. One of the things you can do is, when your cat’s healthy and young and middle-aged, establish what is normal for them. Get to know things about your cat like, why he loves to sit on the back of the sofa and watch the birds or he sleeps in about eight different places during the day or he always greets you at the door or he’s the first to the food dish or always uses his litter box. As soon as you see a change in any cat behavior whether it’s the amount food they’re consuming, whether it’s the amount of water they’re drinking, whether it’s using their litter box, whether it’s that subtle change in behavior that he just didn’t come up and sleep with you tonight and he always does; that’s a reason to alert you that there’s a problem with your cat. He’s either sick or in pain or both and you need to seek veterinary attention. 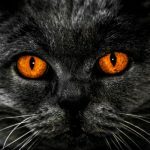 How to give your cat a pill or how to pill a cat? Cats can be notoriously difficult to give tablets to. The basic way to give a tablet to your cat is to put it straight down their mouths. You can either do that using your fingers or a pill popper. You can hide some tablets in food and others you can crush up into a powder and put in their food. However, if you think that you’re going to need to give your cat the tablet with some food, do check with the vet first. That’s because a lot of tablets have to go on an empty stomach or they can’t be crushed. So it’s important to check before you do that. 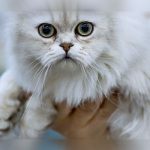 While administering medication to a cat, sometimes it is always good to have another person hold your cat because animals do not like to stay still for medication purposes. You can also use a towel to kind of wrap the cat to make them feel comfortable. This is called kitty burrito. If the cat is not declawed, it protects you and the animal hurting herself. So basically, this wraps them up, it keeps their claws enclosed, their feet enclosed and you are able to just pull the head back. If you have the pill, you just place it down into their mouth, close the mouth and stroke the neck to encourage swallowing. How to give your cat a bath? 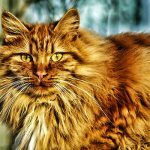 How to safely bathe your cat if you have a cat that is afraid of getting a bath or is more panicky? Some of you need to bathe your cats for medical reasons because they have skin conditions or maybe to get rid of cat fleas. Sometimes you have to give it a bath and this becomes a really big problem when you have a cat that does not like water and freaks out. 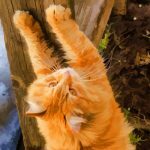 This is where a halter or a cat harness or a leash becomes very helpful in not only containing your cat but handling it in a really safe way and reducing stress. To make this experience as stress-free as possible for the cat, don’t let the leash be too long so the cat can’t run around anywhere. Also make sure that the bath is really quick. It should take no more than five minutes and that reduces the stress. If your cat wants to jump out, instead of grabbing him and freaking out, just grab the leash and just put him back and that is why a leash or a harness is nice. In case your cat panics, it gives you easier control and it’s important in reducing the stress to the animal. It also helps reduce the chances of you getting injured and scratched. Do not spray the water on his face. You don’t want water to get in their ears. It would be great if you can have someone to help you. You need a helper that can hand you things because if you have a cat who’s not a fan of baths you need to be able to hold on to him all the time to make sure he’s okay and safe and that he doesn’t panic or hurt himself. So it helps when someone can hand you soap or later get you a towel or if you need something they can go get it for you. Have all the things you need right there with you and try to be as quick and efficient as possible. If your cat takes good care of cleaning itself on its own then technically, you never have to bathe your cat. So unless your cat really needs it, there’s no point unnecessarily stressing out your cat. Always make sure your pet is stress-free as much as possible. My cat won’t eat. What could be the reason? If your cat doesn’t eat for longer than 24 hours, it could lead to serious health issues such as liver problems. There are many reasons a cat won’t eat. One of them is anxiety. Being at a new place where they have never been to before, causes anxiety for the cat and makes them unwilling to eat. There could be psychological reasons such as depression, maybe their owners left them for a while. The hardest reason to look out for is illness. It could be something as serious as cancer or as small as toothache. It could cause a cat not to want to eat and that could be dangerous. However, there are many things you can do to make a cat want to eat food again. The most non-obtrusive way to make a cat want to eat is making the food tastier for them. Now this can be done by putting maybe a little broth, tuna or cooked egg into their food or even just heating up in the microwave for a little bit making it slightly warmer. It should not be too hot but warm. You can also change the brand of food. However this should be done carefully as this can cause more stress on the cat if they don’t like the food and they will just simply avoid it. There are also some appetite stimulants. The easiest and most known are dried catnip and valerian root. This causes the cat to be less anxious and more willing to eat. Though, valerian root should not be given orally as it can cause liver problems. There are also some medications that make a cat want to eat. However, you should talk to a vet before giving those medicines. There are also pain relievers. You should talk to the vet about these as well. Some cats when they have a toothache and when they’re in pain, they simply don’t want to eat. So pain relievers should be used in those cases to make the cat less in pain and more willing to eat. Some people have a lot of luck with assisted feeding while others not so much as it can cause stress. There are many methods to assisted feeding. The simplest and least obtrusive ways to assist to feed your cat is simply to get some wet food on a finger or spoon and let the cat lick off of it. You could also get a syringe from any pet store or pharmacy and what you do is take a bit of wet food, mix it with water if you have to, put in a blender to make it in liquid consistency and then get it up into the syringe and put it in the corner of the cat’s mouth carefully. Give them a small little burst of food at a time and let them handle it. Never stick the syringe straight down the cat’s throat and force feed. This can cause more anxiety for the cat, more stress and they’ll be less willing to eat in the long run. The cat’s food intake should always be monitored to prevent them from ever getting sick. Even a short period of time without food can make cats weight drop and lead to some liver problems or other health problems. However, a sick cat that refuses to eat is never a lost cause and there are options available to you if you need to feed a cat that is unwilling or unable. And for non terminal illnesses these options can be life-saving literally. The simple answer is because it’s fun. But the interesting question is why it is fun for cats to do that and not so much fun for animals to do it? You will get a clue about this if you watch what cats do in the wild. What they do if they’re hunting? Hunting is a thing that really gets cats motivated and what they really enjoy doing and when they’ve caught something, they don’t just want to kill them and be finished and eat. They want to play with their prey. When you watch them play with their prey, what they do is they battle along and see if it’ll move. If it does, cats pounce on it again and they get all the fun over again. They do the same thing with maybe things on the table and say, “look at it, this could be fun”. They move it a little bit, if it falls off the table, then they get to change something and think,”Oh that was fun”! How to litter train a cat? With most cats, potty training should come second to nature with them. The best way is to keep your cat in a confined space for the first couple of the days. You should choose a good litter box with litter and a scoop. If you keep the litter box in one confined space, the cat will easily find that litter box. Make sure you scoop that poop out every day. 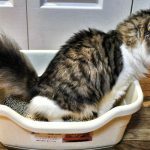 Cats are really clean, hygienic animals and if you don’t scoop those poops out every day, the poop will build up and cats will not want to tread on their own mess. Therefore they will give you a little present outside that litter box. So make sure you clean that poop out every single day. If you find they’re not going in that litter box, it may be the litter they don’t like. Sometimes you do get some fussy cats which won’t like the texture of the litter on their paws. You can go to something like a soil or a corn-based litter or some sort of sand. Sometimes the crystals or the stones may be quite sharp for your cat’s paws. Many times when the cats aren’t used to their new area, they can have accidents. Never hit or be aggressive towards your cat. Your cat will learn and it’s one of those things the cats will pick up quite quickly. But remember, patience is the key.